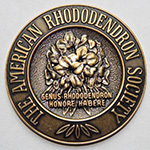 The American Rhododendron Society’s Bronze medal is the highest ARS award presented by individual chapters in recognition of significant contributions by its members towards the betterment of the chapter. To read the ARS Bronze Medal citation for each NIRS recipient, click on either their photograph or name. To return to this page, click on the “Awards” menu item (or tab).